The slide board is a tool that was originally designed to be used by speedskaters but is now being used by a wide variety of sports — hockey being the most popular outlet for its use for obvious reasons. Incorporating a slide board into your training is just like any other tool in strength and conditioning, meaning, there is a right way to do things and a wrong way to do things. The major problem I see so prevalent in the hockey training world is that parents and coaches utilize tools rather than skills. For example, if you need a handyman, it would be wise to find a very skilled carpenter. A carpenter has the skill development in order to use a wide variety of tools and chooses to select the correct tool that will maximize the effectiveness and efficiency of the job at hand. He won’t use a hammer to screw a bolt in, he won’t use a screwdriver saw a two-by-four. Instead, he will self-select the correct tool for the correct job based on his knowledge and skill in carpentry. Yet, so many hockey athletes and parents today are fascinated by tools rather than skills. Base-level trainers are becoming “certified” in the slide board, medicine ball, stability ball, or kettlebell — instead of learning the skills behind what the principles of program design are and how they should be properly implemented into a well-structured hockey training program. A carpenter doesn’t get “certified” in the screwdriver, and trainers should be overemphasizing the importance of any one given training tool. It’s just a tool, and a tool is only ever as good as its application. That’s something I felt I needed to say right off the bat because many of these “tools” appear to the general public or to the uneducated trainer to be “hockey-specific” so they overuse them year-round in hopes of receiving a hockey specific result. But, fall flat on their face because the magic isn’t in the tool…the magic is in the implementation of the tool. The slide board is incredibly unique in its application, it allows hockey athletes to perform their speed and conditioning training but do it in a way that forces the athlete to maintain the bent posture position that is highly sport specific to the skating mechanics you would use out on the ice. Not only does it allow you to perform this action, but it’s the only tool that allows you to perform this action, making it an incredibly unique and useful tool in the scheme of an overall program design. Essentially, you are getting speed training and conditioning training at the same time while also forcing the body to recruit the appropriate muscle sequences and force patterns that you would use on the ice. This is something that’s not possible on any of your standard “cardio equipment” at the gym. Beyond this, it allows hockey players to work all of the extensor muscles of the lower body that are responsible for a strong stride, as well as the hip abductors and adductors that are important muscles for preventing injury. For those of you who may be unfamiliar, a slide board is a long and narrow board that has a slippery surface. Essentially, you put on specialized footwear so that you can slide evenly from side-to-side and mimic the skating motions as much as possible. Because of this design, you can use it to improve lateral changes of direction and high-speed acceleration with minimal joint impact (in comparison to other exercises such as sprints or cone drills). Both slide boards and “mini” slide boards have similar application, although the “mini” slide board isn’t very good for speed and conditioning work and should really only be used for things such as sliding lunges or sliding leg curls. Looking to purchase or learn more about hockey slide boards? Check out one for sale here. It’s very important that you learn these movements first by doing them very slow in the beginning as it kind of has a weird feeling to it the first time you step on, but once you start mastering the technique you will be able to rock it out no problem. I just wanted to throw out the disclaimer here that it’s very important to start slow, because if you just jump on one of these things and go crazy for the very first time it can be really easy to pull your groin. But, once you have mastered it you can start increasing both speed and duration going bodyweight-only. Then, once you have really mastered it, you can progress to loading these movements by wrapping a light band around your waist or wearing a weighted vest. For your starting position, stand on the left end of the slide board with the outside of your left foot in contact with the wall of the board. From here, bend your knees and hips (get in your “athletic” position) as if you’re getting ready to explode laterally in the other direction. Then, push hard off the slide board wall with your left foot while staying low throughout the entire movement, glide across the board staying low and in a wide stance until your right foot makes contact with the other side. Cushion the impact on the other side by slightly bending your right leg before immediately pushing off and sliding back to where you started. Continue this low, wide, side-to-side motion until you have completed the duration of your set. When using the slide board, it’s important to understand that it’s a tool and not a workout. Like I said above, we can’t overemphasize the importance of any one given tool, but instead, use it in the right place at the right time in order to maximize its benefits and minimize its costs. 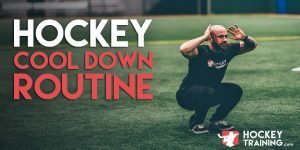 Here is an example workout that a hockey athlete could use to improve his/her ability to cut on the dime and improve their hockey specific agility out on the ice. At the end of the day, the slide boards are a great tool when used properly, but they shouldn’t be seen as a catch-all replacement for all of your other speed and conditioning methods. Always remember, the magic is in the program over the course of many months, and not in single workouts or single tools. If you overdo this piece of equipment, you can easily run into repetitive strain/injury issues as you are already loading these movement patterns a lot out on the ice and already within your other lateral-loading movements in your program. So, keep it smart to keep it effective. It’s a great tool in the right hands. You can pick up a slide board over at HockeyShot if you’re interested. 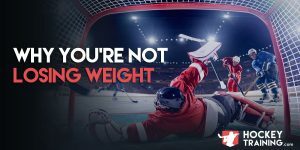 To learn more about how to properly use different hockey training aids and get access to the widest selection of hockey training programs and performance nutrition advice in the world — check out the VIP program. 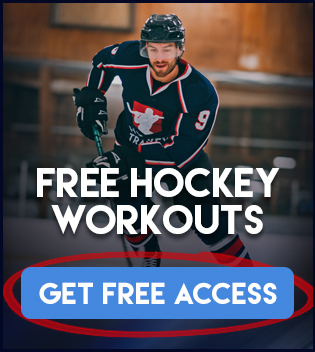 It’s an all-access pass to the best “done for you” programs and protocols we have here at HockeyTraining.com for all ages and skill levels.